Yeah, seriously, who cares about Al Gore? What would it take convince me? I'm not sure why it matters whether reality perfectly matches the models. If you're sick and the doctor says "I predict you will have a fever of 104 by the end of the day", and at the end of the day you have a fever of only 103.7, that doesn't mean you don't have a fever. The model was wrong, but reality is always right. I agree that Humans are responsible for CO2 increase but I'm not sure about how much. I agree CO2 acts as a Greenhouse gas to the tune of 1.1c per doubling. I agree that temperatures rose from 1850 (why wouldn't they it was the end of the Little Ice Age). I also agree that temps rose from 1979 till 1999. But they have not risen since. "I'm not sure why it matters whether reality perfectly matches the models". Was this a Freudian slip? The correct statement should be that the models match reality. So you feel that model validation is not important? I strongly disagree. If a prediction is made for a 100 years in the future I need to see a reasonable fit to the data along the way. So if I may summarize your position. The science is settled and the debate over. In any event I think we both can agree that Climate Change is both interesting and important. We disagree as to why. You feel its important for the Environmental Field and I feel it is important for the Psychology field. Actually, this is one of the easier calculations to make. If you look through the article on climate change research I posted it's all there. The alarming thing to me is how much carbon based fuel has been burned in the last 30 years as other countries started consuming fossil fuels at the same rate we do. Thanks for your comment. I am not angry I was just defending myself. There are so many conflicting arguments both for and against the science that it can get confusing. I respect your right to your opinion. Take care. So you are saying that the acidity in our lakes does not come from facilities West and North of us and comes solely from man burning "carbon based compounds"? That is a theory which is akin to Ostrich Syndrome. (head in sand), AND contradicts your point, (whatever that is). My point is not that I am disagreeing with the fact that we have environmental problems brought on by others having priorities other than concern for our planet but the fact that my opinion or yours has absolutely no bearing on a remedy for the problem. Cap and Trade agreements and greedy people like Al Gore who present unethical practices are NOT the answer either. What can we do to change the trend? You tell me. What is all your ranting and semantic point making doing to help eliminate processes which cause greenhouse gasses? Nothing. I was making a point about a man which Redhawk was attempting to glorify. It has nothing to do with politics on my part. I realize that Global Warming indicators are not associated with our current Ole Man Winter, but the problem is not that I do not recognize global warming it's just that I question what brings it about. And please delineate between what is Science and what is B.S. The radical professor from Rochester to me lacks credibility because of his past actions. The same with Gore. How can you know for sure about the earth's capabilities for absorption based on NASA's scientific evidence that C02 does NOT bring about global warming but instead acts as a coolant? I am not sure that the scientific community is getting it right because they continually contradict themselves. Yes, we have problems. Please tell me how we can remedy those problems. I don't think you can. Schultzz, I most assuredly did not say that acidification of our lakes is due to CO2 emissions. That problem is a result of burning coal in the midwest and the formation of acids in the atmosphere. Please read the article I posted earlier. In it, you will learn that the ocean acts as a giant buffer for CO2. As the oceans absorb CO2 they become more acidic (by formation of Carbonic acid). You will also learn that the amount of carbon put into the atmosphere by humans is around 500 billion tons. You will see that the rate has increased markedly in the past 30 years. This is enough to cause a global rise in temperature. The history of climate science and modelling is well documented, including all the warts and wrinkles. Some really smart people have contributed to our body of knowledge, starting with Fourrier and Ahrraneus. 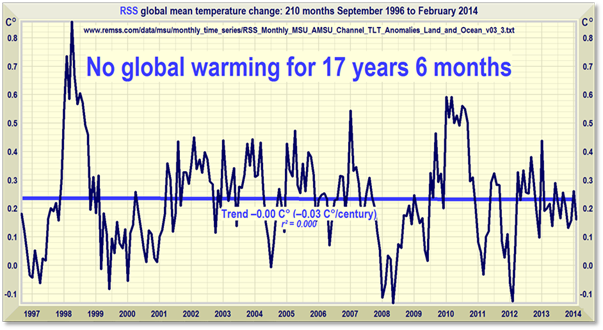 As for NASA, please substantiate your assertion that NASA believes CO2 is a global coolant. In fact, show me any peer-reviewed scientific paper making that assertion. I think it could be difficult to find. According to the link above, we have had 5 ice ages in the past. It would stand to reason that we have also had 5 warming periods as well. All these happened well before man could have any impact. I do not know what causes climate change. It may just be a naturally occurring thermal cycle experienced by the Earth. The biggest problems I see in this debate are the short attention span and willingness for long term planning of the American people, and the rush to pass laws based only on emotions. Add to that the uncontrollable need to label those with dissenting opinions as the enemy. I would say rushing to double or triple our energy bills is unwise. However, a gradual but consistent drive to use sustainable and renewable energy resources would not be a bad thing. Corporations and businesses drive our economy. Government can help or cripple the country. If energy and power are problems we want to tackle, then we need experts in those fields to provide the answers. Politicians with no knowledge of these subjects will only hinder any real solutions. Maybe our current system is just too corrupt for any real progress? This includes both the public and private sectors. If my car breaks down, I go to a mechanic. If my tooth hurts, I see a dentist. I have not seen anything positive occur from politicians recently, and I have become increasingly disappointed with most elected officials. Maybe I am becoming jaded in my old age? I am left with an old saying, "United we stand, divided we fall". "Their ground was that a mere expert reviewer for the IPCC with several reviewed publications to his credit did not have sufficient academic qualifications to be allowed to reply to a personal attack accusing him by name of lying and inviting an odious comparison with Holocaust deniers". I could see why they wouldn't engage him since he would most certainly make them look foolish (the man knows his stuff) but if they did identify him by name as a liar he will sue them for sure. If you type in something like "NASA study claims C02 is a coolant", or words to that effect you will find several articles about that study. I haven't got time to discuss the rest of your post at this time. Have a good evening. I fear you have fallen into a trap that has been well de-bunked. The NASA press release (which is what it was) describes one side of the heat absorbtion equation in the context of solar flares. It has been widely mis-interpreted by many who haven't bothered to understand the whole situation. Go find and read the NASA press release. Then take a good, close look at the enclosed diagram. You need to consider both the scattering and absorbtion of incoming radiation. There's a lot of mythology out there, including the link yo provided. So my challenge remains: Find me a peer reviewed scientific paper that argues that CO2 prevents global warrming. Good luck with that. And with that, I'm kinda done with this ongoing argument. I feel the turbo encabulator could be put to good use in Vt's diagram. If the super ducted fan was magnetically arranged in coordination with the flux capacitor, then differing magnitudes of both the sensible heat flux and latent heat flux could be amalgamated into one giant cluster flux. Corporations and businesses drive our economy. Disagree. It is consumers which drive the economy. Businesses and corporations fill a demand, without a specific business or corporation, the consumer will still spend their money on their wants/needs. Without the specific consumer, there is no money to go to any business or corporation. Where do consumers get their money? One can't exist without the other. I didn't claim that consumers existed without the business or corps. I agree there is a symbiotic relationship. I disagreed with your claim that it was businesses and corps which were the drivers. I countered that it is was the consumers which are the drivers. Both are necessary. Excellent post! Kinda sums up how I feel too. Continuing my thought on model validation I've seen graphs of poor model performance. Of those, this one is the most troubling. This one starts at 1979 which generally is cited as the beginning of AGW and plots the data till 2013. First off you can see that even at the initial starting point the model projections were always high. Even so the model estimates look to be somewhat reasonable until 1998. From that point the gap between estimates and actual temperature grows steadily worse with each passing year. Why is this? I feel that the early close fit was due to the fact that yearly data up till 2000 was part of the dataset that was modeled. It looks to me that the model is having a hard time estimating temperature outside of the modeled timespan. 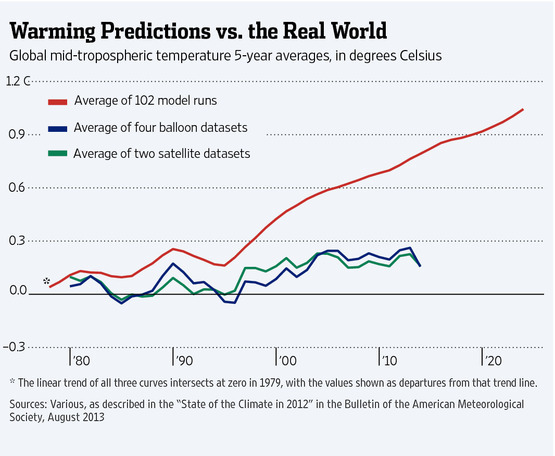 The fact that the distance (gap) between the line of estimate and actual temps increases tells me again that the model is estimating higher at an increasing rate. And Professor Hobbit here is the graph from 1997 showing no trend. Well, first off your attributing that quote to the wrong person. Secondly, this is a forum where we all come to express opinions on various subjects. If a subject doesn't interest you, ignore it. Regardless of one's views on any subject, to suggest we are powerless to change anything is something I strongly disagree with. Public opinion, people like us, won a huge battle over the energy and utility sectors concerning acid rain. We did it with less money, and no PR firms, just good old grass roots work. So if you choose to give up, that's a personal choice. I choose not to. Feel free to quote me.